Red squirrels traded by Vikings could have brought leprosy to pre-medieval England, according to archaeologists. Research has revealed that a pre-Norman skull found in Hoxne in Suffolk has a leprosy strain closely related to a type known to affect squirrels. 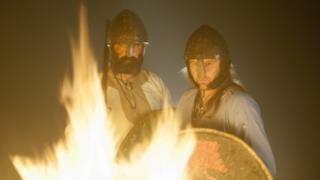 The strain has also been found in Medieval Scandinavian skeletons. Cambridge University’s Sarah Inskip said contact with the “highly-prized squirrel pelt and meat” traded by Vikings could have spread the disease. Radiocarbon dating revealed the woman’s skull, which is held at Diss Museum in Norfolk, dates to between 885 and 1015 AD. It has the same strain of leprosy as that identified in skeletal remains found in Medieval Denmark and Sweden. The research, which has been published in the Journal of Medical Microbiology, cites a recent study demonstrating leprosy infection in red squirrels in Brownsea Island in Dorset. DNA sequencing of the Mycobacterium Leprae strain found in the modern animals showed it was closed related to that found in the Hoxne skull. The strain is found in nine-banded armadillos and has caused some human cases of leprosy in Florida. King’s Lynn and Yarmouth in Norfolk were “significant ports for fur imports” from Denmark and Sweden at this time, she added. The animals were also sometimes kept as pets. The leprosy strain has previously been found in the skeleton of a man from Great Chesterford near Cambridge, dating from 415 to 545 AD, suggesting it had persisted for hundreds of years in south east England.